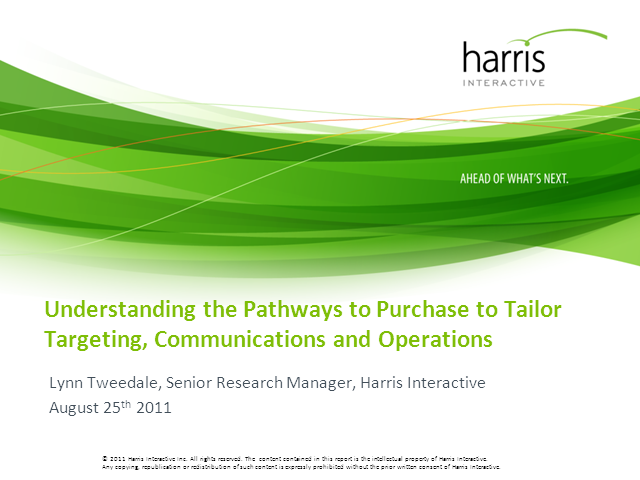 Understanding the pathway to purchase is the key to successful marketing. If you know how your potential customers approach the challenge of making a purchase decision, then you can gear your marketing activity to fit most effectively with this process. And by contrast, if you fail to do this, then you will miss the opportunity to influence their purchase. In May 2010 Harris Interactive conducted a major piece of R&D in the UK, from which we have developed a framework of six different types of pathway. For each pathway we explored the person’s overall strategy, their feelings about the process, the steps they took along the way and their satisfaction with the result. This presentation outlines the key pathways to purchase within Financial Services, offering a powerful insight into their profile, motivations and expression for each of the product and service categories that we researched.